The history of the Sao Bento Palace (that is, the Saint Benedict’s Palace), which is now home to the Portuguese Parliament (or the Assembly of the Republic, in Portuguese, Assembleia Nacional), goes back to the late 16th century, when a monastery used to fill the site of the present edifice. The former monastery was reputed as being the first Benedictine monastery in Lisbon, later restored in a Mannerist style (in the 17th century) as the design of Baltazar Alvares and of Joao Turriano would indicate. 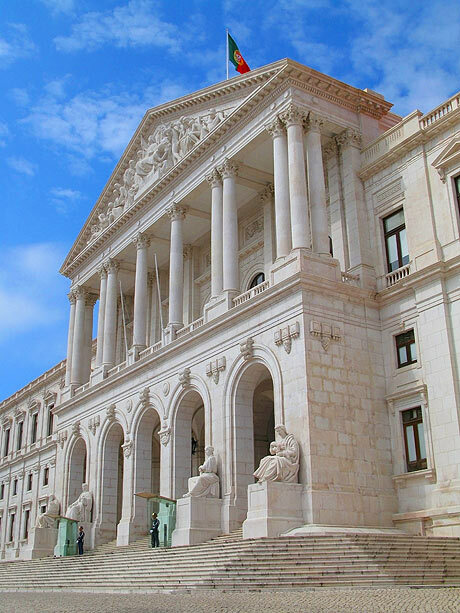 Damaged in the 1755 earthquake, the monastery became in the first half of the 19th century (1834) the seat of the Portuguese Parliament under the name of Palacio das Cortes or Parlamento. The original monastic complex was dramatically altered in its architectural structure after the installation of the Parliament, requiring the contribution of sundry architects: Possidonio da Silva, Jean François Colson, Miguel Ventura Terra, Adolfo Marques da Silva, Cristino da Silva and Fernando Tavora. These architects were either commissioned to turn the edifice into a venue able to accommodate the specific activities of the institution or to restore it subsequently to sundry unfortunate acts of god (earthquakes, fires) or by force of the need to enlarge the initial building. At present, the parliament building stands out as an imposing neoclassical structure, flanked by four allegorical statues, with a facade pegged by tall columns which sustain the pediment. It is worth visiting due to both its historical background and to its current political significance.